The University of New Mexico wants to support those students, staff, faculty, and their partners/spouses who chose to continue breastfeeding their children after they return to school or work. The Breastfeeding Support Program includes lactation rooms on campus, some of which are equipped with hospital-grade pumps, links to lactation resources, and facilitates communication between current, past, and future breastfeeding women on campus. 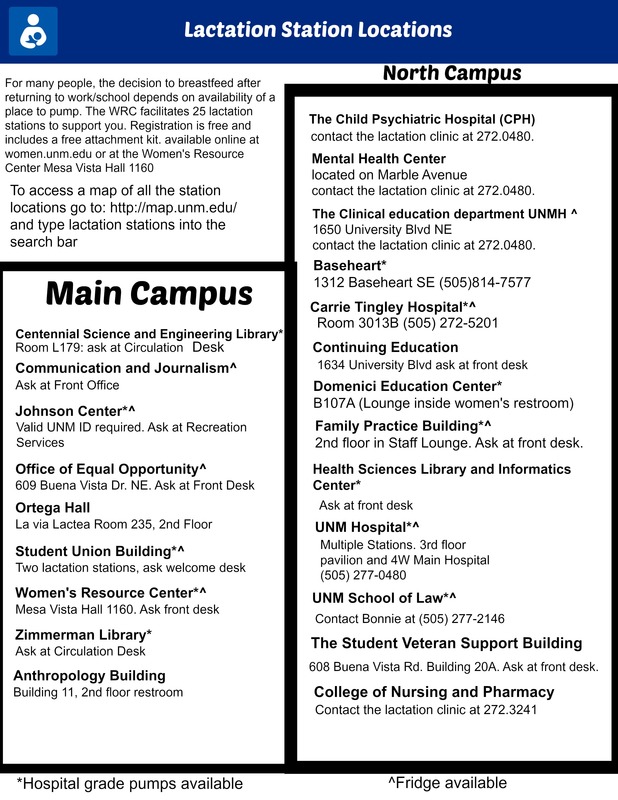 Lactation Stations are safe places around UNM campus for mothers to breastpump or breastfeed. You can see these locations on the campus map here. Once you are on the map, check the "lactation stations" box on the left hand side of the map directory. To begin the Breastfeeding Support Program fill out the Breastfeeding Support Program Registration Form to use any of the services (e.g. lactation room). Registration is free to all UNM students, staff and faculty members and their partners/spouses, and allows the Women's Resource Center to track the use of the program. The Breastfeeding Promotion Act, HR 2122, was reintroduced in the House of Representatives on May 10, 2007. The BPA amends the Civil Rights Act of 1964 to protect breastfeeding women from being fired or discriminated against in the workplace, provides tax incentives for businesses that establish private, lactation areas in the workplace, provides for a performance standard for breast pumps, and allows breastfeeding equipment to be tax deductible for families. For more info go to Representative Maloney's (D-NY) home page.